Authors are ROCKSTARS! : Got a question for Leigh Bardugo? Leigh Bardugo is going to be back on the show, ya'll, and we couldn't be more excited. To celebrate, we are opening up the floor to YOUR questions. What do you want us to talk to Leigh about? Let's make sure we aren't asking for spoilers, OK? Although, to taunt you, I am reading Siege & Storm right now and o...m....g, but that's all I'll say. Leave a comment here or tweet us at @AuthorsROCK. We'll enter everyone who does for a chance to win some limited edition Shadow & Bone nail polish and buttons! (1 entry per person, not per question) Get 'em in by April 25th. We'll announce the winner(s) shortly after. And stay tuned.. up next on the podcast, C.J. REDWINE! I know you finished Ruin and Rising a couple of weeks ago, and so what was the process like for you and how did you resolve the relationships between characters, whichever way they ended, and how was THAT like for you? Sorry if the question doesn't make sense. Leigh, did you have a clear ending to the series when you started drafting and writing the first book? When did it become known to you what you wanted the ending of the series to be? Alyssa, please email me at michelle (at) authorsarerockstars.com. You won a button & Shadow & Bone nail polish! Leigh, when writing the Grisha Trilogy, did your ideas for the plot change at all and if so how did that effect the story and its following books? I had a question about some of the influences of Shadow and Bone and the trilogy in general. I read in an interview that Leigh likes Harry Potter- did Harry Potter influence the story at all? Orphans, the "magical" school setting, the richness of the characters, even the stag and at one point, "Always" :) I mean it as the highest compliment; it wasn't overt and I might have been picking out more than there was, but either way it was enchanting and perfectly done! Hello Ms.Bardugo, well my question is...Can you tell us if it's true that you are writing another story set in the Grisha world? and if it´s true, can you give a little clue? like...if it´s in the present of Alina and Mal, or years later after the events of Ruin and Rising or in the past before Shadow and Bone? Hey Leigh! I've been currently reading S&B and was somewhat unclear about the environment surrounding The Unsea in the very beginning of the story. Could you expound upon it more? Sandskiffs are mentioned. Are folks sailing through murky water or all sand, etc.? Hey Leigh! I love S&B. My question is, are we going to learn more about grisha mythology? I've been wondering a lot if there is a special reason why a person is grisha. 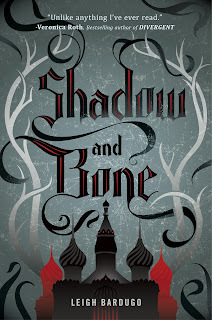 If you were to add all the words that were drafted and cut to the finished copy which book would be longer, shadow and bone or siege and storm? I must say the Darkling is THE MOST CONFUSING CHARACTER EEEEVVVVEEEERRRR!!!! I think he's this guy but then he does/says something and I'm confused all over again.. I've read the 1st 5 chapters of Siege and Storm and please I don't think I can take any more confusing characters but I'm pretty baffled with what to make of Sturmhond & others on the ship. I guess there isn't really a question but maybe if you can give me a glimpse of hope I will be able to decide what side people lay on when Siege and Storm is over, it will aid in helping my confusion. Jessica, please email me at michelle (at) authorsarerockstars.com. You won a button & Shadow & Bone nail polish!